We provide cosy comfortable air conditioned accommodation on the enchanting island of Tobago. Our location is just a stroll away from the pristine beaches of Store Bay and Pigeon Point Beach. We have eight bedrooms and all of them have en suite toilet/bath, with hot/cold water. The bedrooms also come with television, built-in cupboards, air conditioning and ceiling fans. There is a mix of double and/or twin size beds in each room. The entire building can comfortably accommodate as many as Thirty-Two persons in a cosy, air-conditioned homely setting. Due to the increasing demands from past guests we have recently created affordable mixed Dormitory accommodation in the Attic of Candles in the wind. We have installed an initial twelve (12) single beds and there is ample room for a whole classroom, if required. The washroom facilities are shared while use of the fully equipped kitchen on the other floors is available together with self-serve laundry services. Dormitory style accommodation does NOT get better than this. In fact the following Backpacker's rate for a single bed space is considered the best in the Crown Point area., so I am told. We have two fully equipped kitchens, one on each floor of the building. Each kitchen has fridge, cooking range, microwave, toaster, electric kettle coffee percolator and generous assortment of cutlery and utensils. We have also provided a large capacity washer and dryer in the laundry area that is available for your free usage. A lazy stroll along the pristine beaches of nearby Store Bay, Pigeon Point or one of the many others around the Island's coastline. A journey on a 'Glass bottom boat' towards the Famous Buccoo Reef and Nylon Pool.There you can snorkel among the hundreds of tropical fishes, observe the huge 'Brain corals' and other Marine life. Ride the surfs at Mount Irvine beach and maybe have a chat with another International Surfer like yourself. Trek through the Lush Rain Forests and discover the Flora, Fauna and waterfalls of the Island. Dive into the clear Caribbean waters off Speyside or Charlotteville and encounter the gigantic but gentle Manta Rays. Swim with them while being escorted by a kaleidoscope of other Tropical fishes darting in and out of your path. Maybe you wish to flex your arms and putt that golf ball way across the greens to the next hole. Care to do so on one of our Championship Courses? See you on the greens. If nothing else, you must include among your luggage your suntan lotion and swim wear and snorkels. 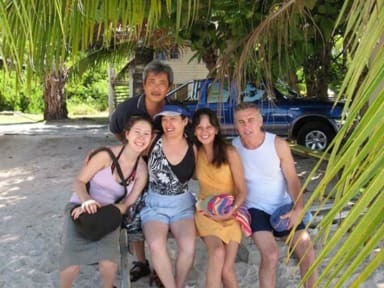 We can arrange / provide Bikes ,Vehicles , Island and Glass Bottom Boat tours at nominal rates . While on the island, don't hesitate to sample the local cuisine which must include our delicious,ever popular 'Crab and Dumplings'. 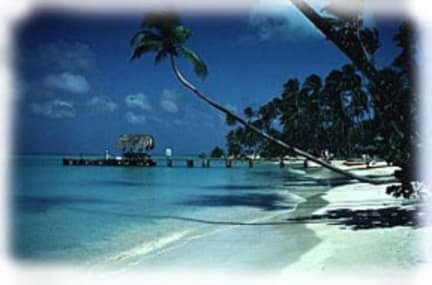 MOST OF ALL,...abandon time and savor the enchantment that Tobago has to offer. We do not have Credit Card facilities at this time and would therefor appreciate receiving the balance of payment in US dollars or Travelers Cheques upon arrival. NB:- All Accommodation Rates are subjected to an additional 10 % Government Tax which is NOT included in the quoted BOOKING rates.